No matter how big your Thanksgiving feast is or how many people are gathered around your table, chances are there’s more leftovers than you know what to do with. Here is a way to use the extra turkey, stuffing, mashed potatoes, plus anything else that graced your holiday table and make it into something new. 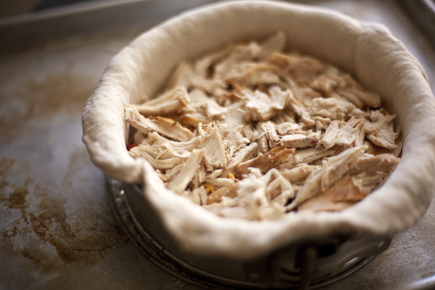 We feature an Italian Torta recipe in Artisan Pizza in Five, but why not swap out the layers for all those leftovers? It is tasty and gorgeous and goes together in a flash if you are cleaning out the fridge of all those half empty tupperware containers. Zoë’s Thanksgiving Leftovers Torta (your torta will be different layers, but you can follow the same technique of layering). 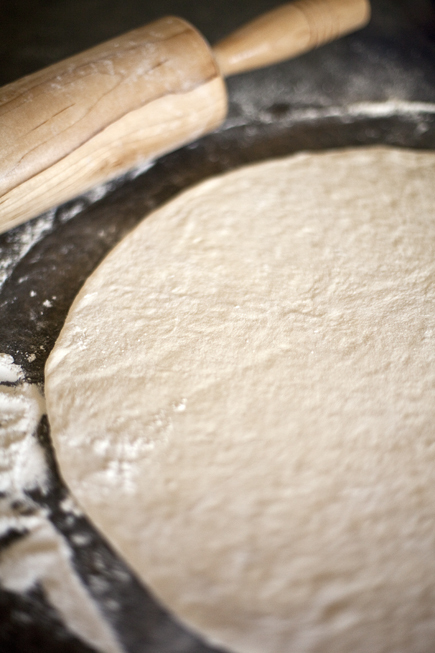 Roll out 1 pound of the dough into an 1/8-inch-thick circle. 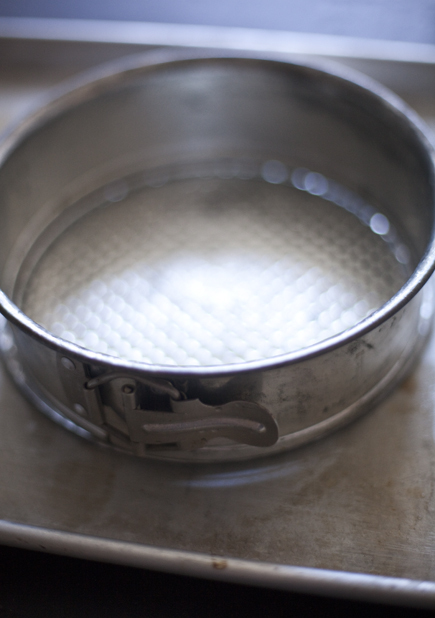 Place the circle into the prepared pan. Start with a thin layer of the cheese. I then added some spinach, which a squeezed all the liquid out of. 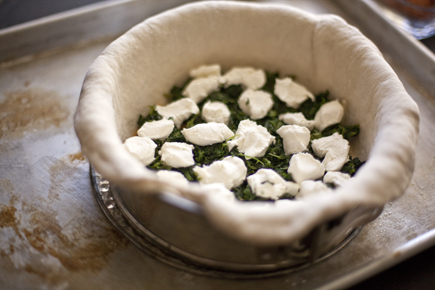 I then added 2 ounces of cream cheese, which added some creaminess and also acts to bind together the layers. 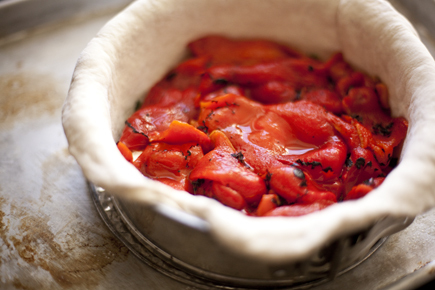 Next came a layer of roasted red peppers, because I always add a layer of roasted red peppers! A little more cheese and then a layer of turkey or chicken or tofu. 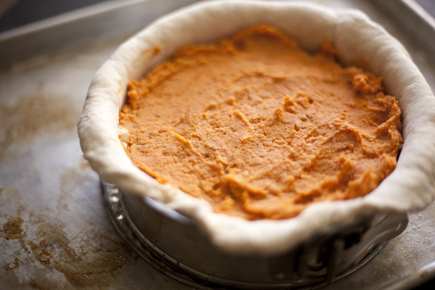 Mashed sweet potatoes are a nice addition for flavor and color. Roasted Brussels Sprouts, split in half and then the remaining cheese. Roll out the remaining 4 ounce piece of dough and drape it over the fillings. Brush the top with egg wash. 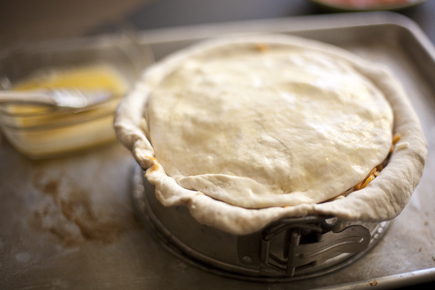 Fold the edges over the top and then brush it with egg wash again. 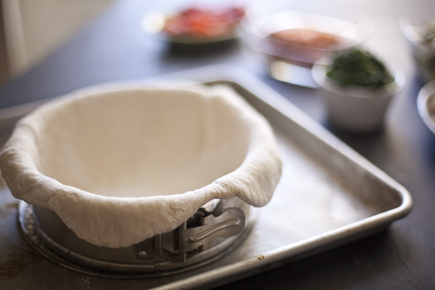 Make slits in the top, to allow the steam to escape. 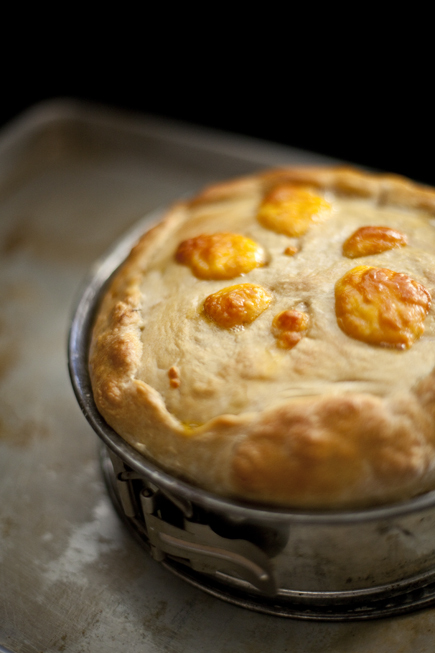 Bake for about an hour, or until the top is golden brown and the cheese is bubbly. Let the torta rest for about 10 minutes. Remove from the springform pan and let cool on a rack for about 20 minutes. Once the torta has cooled slightly it will hold together when cut. You can eat it warm or at room temperature. 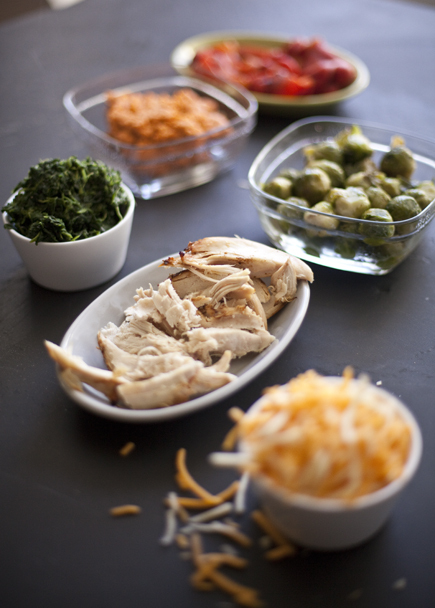 What a great way to dress up leftovers. Can’t wait to try this. 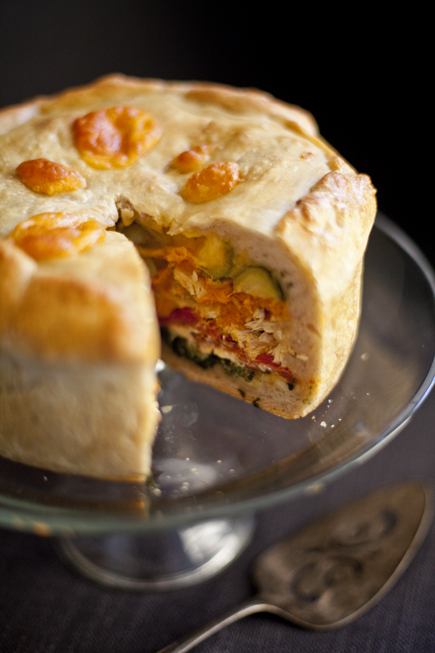 Your Torta looks delicious. 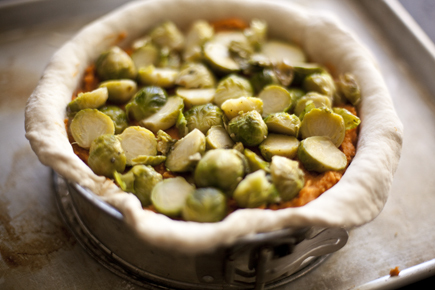 Great idea using the Thanksgiving leftovers. I make one similar without the meat that I recently posted as well – it’s always a hit and gone within a couple of days. Holy cow! That looks awesome! I’ve just bought the UK version of the book but I can’t get my gas oven up to the 230 degrees (210 max)that it says for the master recipe. Would you know how I can compensate for this (time and temp difference). It is just that the gas pressure in our area is low. You are referring to 210°C? 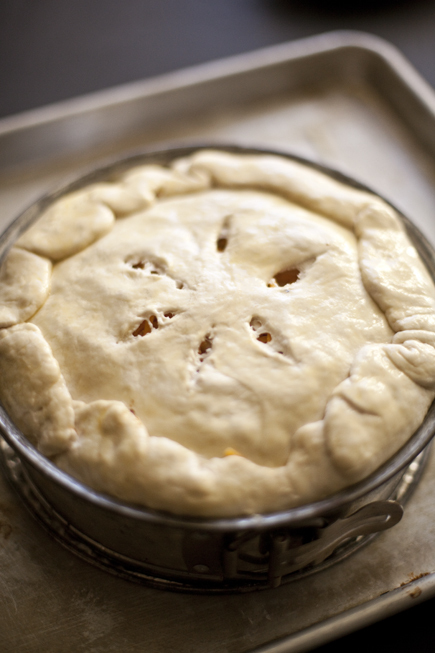 You will want to increase the baking time by about 20 minutes. 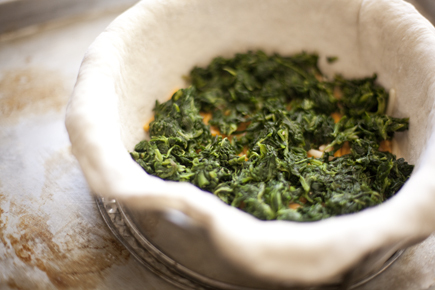 You will not get as crisp a crust, but it will bake through. Once I’m done w/ it, I guess it will be pretty carb heavy! 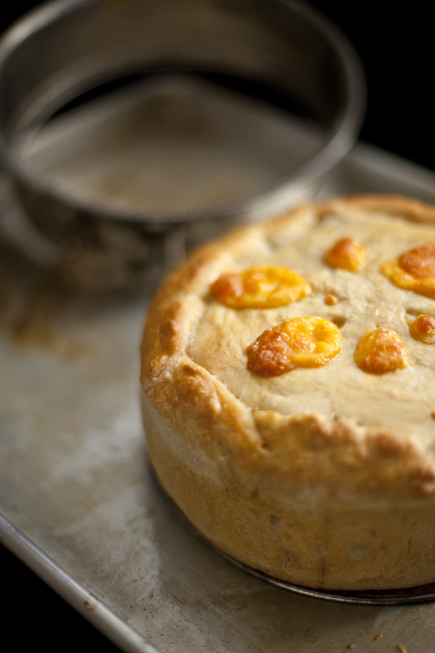 I’m hosting a New Year’s Day brunch and this seems like a great way to incorporate several traditional foods into one savory treat. Thanks for the inspiration! I made this torta and it turned out beautiful! Very impressive. I cannot wait to make it for family and friends and wow them. I used layers of ground beef browned with onions, hard salami, spiced black olives, hard boiled eggs, and mozzarella cheese as my filling. Thanks for the wonderful recipe! 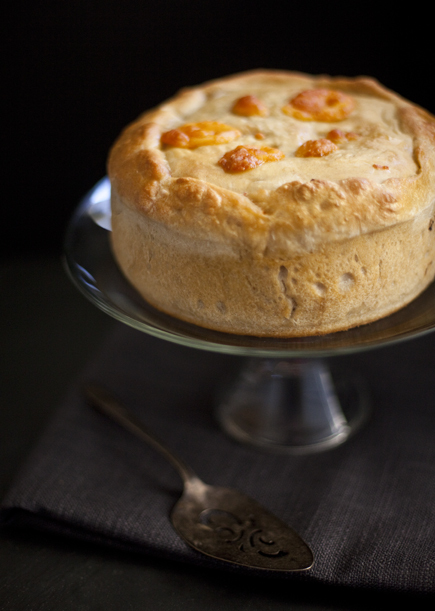 Your Italian Torta (p.193 Artisan Pizza and Flatbread in Five Minutes a Day) is a fabulous recipe. I refrigerated the leftover torta. Is this necessary? I’d like to make and bake it and leave it at room temperature until serving it the next day. Please advise. It really depends what you put in the torta. I have made them and left them out, but if you have meats in the filling, then you should probably refrigerate it. If you live in the UK, you can put it in the pantry, which in our house was extremely cold. I would put it in the fridge myself, taking it out 20 minutes before serving. This looks absolutely fantastic, and I would love to try it, but being lactose intolerant, the only cheese I can tolerate is old cheddar. Can’t make the other one referred to by someone else, because I’m also allergic to eggs. Shoot !!! You can do it with any cheese you like. I think a bit of aged cheddar would be really nice.